There is no question that Ramey's message, even when greatly enlarged and then enhanced by computer, is a very difficult read because of fuzziness, film grain noise, uneven development, photo defects, paper folds and tilt, shadows, and text obscured at the left margin by Gen. Ramey's thumb. However, there are various keywords and phrases that can be readily seen by anyone, even in lower resolution scans of the message first analyzed in 1999 by a number of people. These keywords and phrases unambiguously prove that there is no truth whatsoever to the various Air Force "explanations," be they the original 1947 "weather balloon" story, or the Air Forces updated "Mogul balloon" and "crash dummies." Far and away the most important word of the entire message is "VICTIMS" on the third line (part of phrase "THE VICTIMS OF THE WRECK"). If there were "VICTIMS", then this was no Mogul balloon crash. As the Air Force Roswell report itself noted (using splendid circular reasoning) reports of bodies being recovered couldn't be true because the crash was of a Mogul balloon, which had "no 'alien' passengers therein." Of course Ramey's mention of "VICTIMS" in 1947 also disproves the already preposterous "crash dummies" theory. The only way these 1950's crash dummies could be "victims" is if they also time-warped back to 1947. Another easily seen keyword and phrase is "DISC" and "IN THE 'DISC" on the fifth line. Ramey is clearly describing the crash object as a "DISC", not as a "weather balloon", or a "Mogul" or a "radar target" or a "RAWIN" (jargon term for a radar wind target), or any other word or phase that in any way suggests some sort of balloon or balloon paraphenalia. In fact, the only mention of "weather balloons" and "RAWIN" targets comes at the very end of the message in the context of issued public statements and damage-control. "IN the disc." Neither balloons nor the two-dimensional, flimsy radar kites had anything "inside" that could be shipped. If Ramey had been referring to some piece of balloon payload equipment, then the phrase should have begun with "attached to" or "suspended from", or "with", etc. In speaking of "THE VICTIMS OF THE WRECK",, using the word "DISC" for the crash object, and shipping something "IN THE DISC", Ramey is clearly referring to something other than a balloon crash. The simplest interpretation is to take the words literally. There is no reason for Gen. Ramey to be describing events abstractly in a secret communication to his superiors. This was the actually crash of a so-called "flying disk" craft with a dead crew found on the inside, as corroborated by the testimony of military and civilian witnesses. Ramey is quite explicit about the existence of bodies and the crash object being a "disc." The only thing not made explicit in the message is the exact nature of the bodies or "disc." Ramey probably does not refer to the bodies as "nonhuman," "alien," or some similar term. Nor does he use terms like "spaceship," "craft of unknown origin," etc. to describe the "disc." Among the theories about the Roswell incident is that this was the crash of some highly secretive government experimental craft piloted by a human crew. However, nobody has ever presented evidence that such an experimental disk-like craft ever existed or was tested in New Mexico at that time. It also seems highly unlikely that even a highly secret craft but with half-century-old technology would still be kept secret. Further, it makes no sense that the government would be completely unaware of the crash of one of their own craft until some sheep rancher came into town to report it. The same logic applies to the crash of something more conventional, such as a bomber carrying nuclear weapons (another theory sometimes proposed). The military would not wait for a local rancher to tell them about it nor would there be any need for continued secrecy into the present day. (Similar nuclear accidents have been declassified and are now in the public record.) And why would Gen. Ramey call it a "disc"? Finally, both the Air Force and General Accounting Office (investigating on behalf of Congressman Schiff) in 1995 reported that air crash records revealed no plane crashes in that area during that time frame that could possibly explain the Roswell incident. In brief, there is simply no evidence for the crash of any conventional or experimental aircraft. There seems to be no conventional explanation that squares with the statements found in Gen. Ramey's memo. But when we look at the contents of the message in conjunction with witness testimony, the evidence clearly points to an actual flying saucer crash, as astonishing as this conclusion may seem to many. New! 2007 Lt. Walter Haut: Former Roswell base public information officer who issued the base press release. Haut's "deathbed" sealed affidavit has just been published. In it he confesses to seeing the spacecraft and bodies in base Hangar 84/P-3 and tells us the mysterious press release was Gen. Ramey's idea to divert press and public attention away from the closer and more important craft/body site. New! 2007 Sgt Frederick Benthal: Army photographer flown in from Washington D.C., said he photographed alien bodies in a tent at crash site and saw large quantities of crash debris being hauled away in trucks. New! 2007 PFC Elias Benjamin: Roswell MP, said he escorted the alien bodies from the heavily guarded base Hangar P-3 to the base hospital, and saw a live one being worked on by doctors; was threatened afterwards if he didn't keep quiet. New! 2007 1st Lt. Chester P. Barton: A crypto specialist and assigned to an MP unit, Barton said he was ordered to the crash site 45 minutes north of town to check on the cleanup, saw a football-field-size burn impact area heavily guarded by MPs, scattered metal debris, was told radiation was at the site, heard archeologists had first discovered it, and also heard bodies were taken to base hospital and then to Fort Worth. Because of what he saw, he knew that the balloon explanation was ridiculous and there had been a cover-up. However, Barton was unusual in being a flying saucer crash skeptic, instead thinking that it was maybe a B-29 crash and nuclear accident. Major Jesse Marcel: Then the intelligence chief at Roswell and the first to investigate sheep rancher Mack Brazel's find, Marcel confirmed in a number of interviews 30 years later that the crash debris had highly anomalous properties and was "not of this Earth." Marcel also spoke of Ramey's weather balloon cover-up at Fort Worth. Click on link to Marcel for more information on his service record, which belies efforts of debunkers to paint him as hysterical and incompetent. Note particularly highly laudatory post-Roswell evaluations by base commander Col. William Blanchard, Gen. Ramey, and future USAF Chief of Staff Col. John Ryan. New! Marcel's testimony on anomalous debris. Marcel's sighting before Roswell & other witnesses seeing saucer explode. Bill Brazel Jr.: Rancher Mack Brazel's son, Bill Brazel independently corroborated many details of Marcel's testimony, including the strange debris, the large, elongated debris field, and his father's story of an explosion in the middle of a violent electrical storm. (Brazel's testimony on debris) New! Louis Rickett: One of the regular Army CIC agents in Marcel's office, Rickett confirmed the anomolous quality of the debris, a major cleanup operation at Brazel's ranch, high secrecy, and being involved in a subsequent investigation to determine the trajectory of the craft. He was also told by others about the shape of the main craft. Like Chester Barton, he placed the main impact site a 45 minute drive north of Roswell. (Rickett's testimony on debris) New! New, 2009! Chester Lytle: The nuclear engineer who built the first A-bomb implosion detonator revealed being told by Roswell base commander William Blanchard, a personal friend, that Roswell was an alien spacecraft crash and four bodies had been recovered. All were eventually taken to Wright-Patterson for study in a highly secure facility. He personally knew the general in charge. He also learned from other sources who had seen the bodies results of the autopsies done. Major Gen. Kenner Hertford, head of the Army's atomic energy department, who Lytle said had a UFO sighting with him at Kirtland AFB, was also convinced Roswell was extraterrestrial and bodies were recovered. Steven Lovekin (served in the White House Army Signal Corp durng Eisenhower and Kennedy administratons, 1959-1961) Although like Exon not a direct participant, Lovekin said he received 1959 Pentagon briefings and being shown a metallic beam with symbols from a 1947 N.M. crash (presumably Roswell) plus being told of either 3 or 5 aliens being recovered, one initially alive. He also said he was shown very compelling photographic and radar evidence of UFOs. He also testified of the threats against military personnel given this information if they were to publicly reveal it. Finally, he told of Eisenhower's concern over losing control of the situation with power falling into the hands of private corporations given access to the materials. Lovekin is a Disclosure Project witness. Video testimony; audio testimony. For transcribed exerpts click on Lovekin's link above. Testimony on metallic beam added to debris section. Brig. Gen. Thomas Dubose: Gen. Ramey's Chief of Staff in 1947, Dubose handled the high-level phone communications between Roswell, Fort Worth, and Washington. Dubose went on record many times about the high secrecy involved (including the matter going directly to the White House), receiving direct orders from Washington to instigate a cover-up, Gen. Ramey's weather balloon cover story, and a highly secret shipment of debris from Roswell to Fort Worth, Washington, and Wright Field. Dubose's damning testimony made him a complete nonentity in the Air Force's 1995 Roswell report, which didn't even bother to identify him in the photos taken of Gen. Ramey with his weather balloon. Click on link to view Dubose's Air Force biography, his sworn affidavit, and a more detailed discussion of his testimony which the Air Force was so eager to avoid. Sgt. Robert Slusher and PFC Lloyd Thompson: Crew members on a mysterious B-29 flight from Roswell to Fort Worth on July 9, 1947, transporting a large wooden crate in the bombbay surrounded by an armed guard. Upon arrival, the plane was met by high brass and a mortician. This is probably the flight referred to in the Ramey memo that would ship whatever was "in the 'disc'" to Fort Worth by a B-29 Special Transport plane. Click on link to view Slusher's affidavit and the account of Thompson's testimony and flight log. New 2007! New witnesses to the flight, including daughter of the head security guard, saying that alien bodies were inside the crate. Frank Kaufmann: A highly controversial witness claiming to be one of the exclusive members of a special CIC-team (Army Counter-Intelligence Corp) in charge of the Roswell recovery operation. Nonetheless, some of Kaufmann's claims seem to be corroborated by the Ramey message, including the existence of such a team, the recovery of an intact "disk" with bodies inside about 35 miles north of Roswell base, and the special team being responsible for the initial Roswell base press release. Kaufmann also testified to knowing of a wooden crate guarded in a hangar with the bodies packed inside awaiting shipment, perhaps the same crate independently described by Slusher and Thompson. However, in light of the Ramey memo, that places the finding of "victims" and a "disk" on around July 8, Kaufmann's statements about a July 5 recovery date for the craft and bodies is almost undoubtably false, as was his crash location. (New! See also recent CUFOS exposure of Kaufmann faking documents -- PDF file.) Shortly before he died, Kaufmann changed this craft/body recovery site to a more westerly location closer to the debris field site. See page on the military cordon for more information about these sites. Glenn Dennis: A Roswell mortician and another highly controversial witness, Dennis spoke of receiving strange calls from the base about preservation techniques and child-sized coffins. Dennis also claimed to be at the Roswell base hospital, seeing unusual debris in the back of an ambulance including a pod-like object perhaps alluded to in the Ramey message, and being threatened. He also claimed to know a Roswell nurse who assisted in a preliminary autopsy at the base hospital and who described the aliens to him. The nurse subsequently disappeared. Click on link to see Dennis' affidavit and summary of his testimony. However, attempts to identify the mystery nurse have proven to be a complete failure after Dennis provided a false name. However, also see some corroborative evidence immediately following Dennis' affidavit, such as David Wagnon, a medical technician, who remembered the nurse fitting Dennis' description, as did Pete Anaya, who said the pretty nurse he knew and encountered at the base hangar telling him of the bodies there subsequently disappeared. Roswell police chief L. M. Hall. stated that Dennis was telling him of calls from the base about small coffins for the aliens only a few days after the crashed saucer story broke in the Roswell papers. Similarly, S/Sgt. Milton Sprouse also said he heard of the coffin call from Dennis and a medic friend told him of the alien bodies and autopsy at the hospital. The medic and doctors and nurses involved in the autopsy all immediately were transferred and their fate remained unknown. In addition, other independent witnesses have provided first and second-hand testimony about small bodies being found with details very similar to those provided by Dennis, including Walter Haut, Frederick Benthal, Eli Benjamin, and relatives of "Pappy" Henderson, immediately below. Sgt. Robert E. Smith: A member of an air transport unit at Roswell, Smith said he helped load crates filled with debris for transport by C-54's, including one flown by Henderson and his crew. Smith was also among the witnesses to describe the mysterious "memory foil" which he said was in the crates. He further described strangers to the base dressed in plainclothes and flashing ID cards for some unknown project, perhaps part of the special CIC-team mentioned in the Ramey memo and by Frank Kaufmann. Finally he claimed that distant cousin of his was with the Secret Service and was there at the base representing President Truman. (The same name was also provided by Kaufmann.) Click on link for Smith's affidavit. Earl Zimmerman: Formerly with AFOSI (AF counterintelligence). While in officers' club heard many rumors about flying saucer crash and of it being investigated under the guise of an airplane crash. Several times observed Gen. Ramey and Charles Lindbergh being at base unannounced in connection with this. Like Robert Smith, spoke of seeing an unknown CICman being at base. Col. Blanchard told him it was OK. Later worked with astronomer Dr. Lincoln LaPaz and corroborated story of Roswell CICman Lewis Rickett that LaPaz investigated Roswell afterwards with the help of the CIC to try to determine objects trajectory. Again an airplane crash was the cover story. Lt. Robert Shirkey: Then the assistant operations officer, Shirkey witnessed the loading of the B-29 that took Major Marcel to Fort Worth to see Gen. Ramey. He said he saw boxes of debris being carried on board, including an I-beam with raised markings and a large piece of metal, brushed stainless steel in color, obviously not part of a tinfoil radar target. He was told it was from a flying saucer. Along with witness Robert Porter, he also stated that the plane's pilot was Deputy Commanding Officer Lt. Col. Payne Jennings, who was now the Acting C/O with Col. Blanchard officially on leave. Nine days later, Shirkey was abruptly transferred to the Philippines to a post that didn't exist. Jennings personally flew him to his next assignment. Click on link to see Shirkey's affidavit and link to other testimony. See also debris descriptions. New! Sgt. Robert Porter: Was on Marcel's flight to Fort Worth and was handed wrapped packages of debris samples. Said that flight was piloted by Deputy base commander Jennings. He was told on board that the crash material was from a flying saucer. Later, they told him it was a weather balloon. Said debris was loaded onto another plane. Click on link for affidavit. Art McQuiddy: Former editor of the Roswell Morning Dispatch. Said base commander Col. Blanchard admitted to authorizing base press release and of strange material being found by his men. Judd Roberts: Co-owner of Roswell radio station KGFL owner. Spoke of how they wire-recorded an interview with rancher Mack Brazel for later airing, then withdrew it about receiving warnings from Washington about losing their license. Testified to seeing a military cordon around Brazel crash site. New! William Woody: Another witness to a military cordon thrown up up north of town along the main highway, blocking access to the west. Click on name for Woody's affidavit. Lydia Sleppy: Albuquerque teletype operator and one of earliest witnesses. Stated that the story phoned in from field by Roswell radio reporter Johnny McBoyle about seeing the crashed saucer and hearing of bodies was intercepted and cut-off on the teletype wire by the FBI. Loretta Proctor: Neighbor of rancher Mack Brazel. Brazel told her and her husband of finding strange material before going to Roswell, and showing them a wood-like piece that couldn't be cut or burned. They advised him to go to Roswell and report it. Brazel was detained at the base and complained bitterly of his treatment when he returned. New! See debris descripions for more testimony. Sally Strickland Tadolini: Another neighbor of Brazel's. Although only 9 years old at the time, remembered Mack Brazel's grown son Bill Brazel bringing over a piece of metallic-looking debris with memory properties to show to her family (incident corroborated by her mother). Described it as tough, resembled a smooth "fabric" like silk or satin, and, of course, unfolded itself to its original shape after being crumpled up. Independently corroborated Bill Brazel's story of finding material and also Marcel's of a metallic fabric material with memory properties which he could blow through (therefore not balloon material). Also remembered the adults talking about Mack Brazel's bad treatment at hands of military. Dr. Jesse Marcel Jr.: 11-year old son of Major Marcel in 1947, recounts how his father woke up his mother and himself in the middle of the night when he returned from the debris field, showing them the pieces of a "flying saucer." Among other material, he distinctly remembers a small metallic "I-beam" with purplish "hieroglyphics." New! See also debris descriptions for more testimony. Irving Newton: Weather officer at Fort Worth used by Gen. Ramey to certify identity of weather balloon debris shown in Fort Worth photos. Newton's is a big-time skeptic and the Air Force used his affidavit to bolster their claim that Major Marcel found the remains Mogul balloon and misidentified it as coming from a flying saucer. However, Newton is only a witness to what was shown to him in Ramey's office, not what was found at Roswell. Both Col. Dubose and Marcel said the weather balloon was substituted for the real Roswell debris. Newton's disparaging remarks about Marcel's behavior in Gen. Ramey's office are contradicted by Marcel's record and Ramey's own highly complimentary remarks about him a year later. Telegram held in General Ramey's hand provides smoking gun proof of a "disk" crash and the recovery of "the victims of the wreck"
On July 8, 1947 at 5:26 EDT, an Associated Press news wire announced that Roswell Army Air Field had reported recovering a "flying disk" from a nearby rancher's property, first found "sometime last week," and that it was being flown to "higher headquarters." The curious base press release triggered a national press feeding frenzy. Later "higher headquarters" was announced to be Brig. Gen. Roger Ramey, head of the 8th Army Air Force at Fort Worth, Texas. The Roswell 509th Bomb Group was a subcommand of the 8th AAF. It was also announced that the recovered "disk" was eventually destined for Wright Field, Ohio, home of the Air Materiel Command and the AAF's aeronautical research labs. Within about an hour of the press release, Gen. Ramey began putting out an alternate weather balloon version of the story. And about two hours later, the photo at the above right was taken of Gen. Ramey (crouched down) and his Chief of Staff, Col. Thomas Dubose (seated). 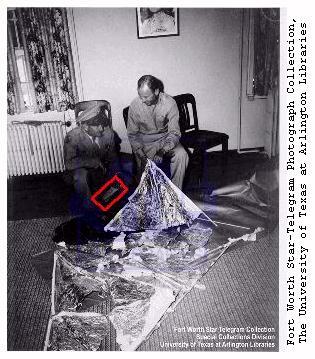 Ramey repeated his story that what was recovered at Roswell was nothing more than the remains of a weather balloon and its aluminum foil radar target kite shown displayed on the general's office floor. Later Ramey brought in a weather officer to make the identification official. The press bought the change of story. Just to make sure, the Army and Navy engaged in a debunking campaign during the following days which involved weather balloon and radar target demonstrations. The weather balloons, the public was told, explained not only what was found at Roswell, but also accounted for the numerous "flying disk" or "flying saucer" sightings that preceded the Roswell events. This was the official story for the next 47 years until constituents asked Congressman Steven Schiff of New Mexico to look into it. After getting what he thought was the run-around from the Air Force, Schiff in 1994 asked the Congressional General Accounting Office (GAO) to investigate, forcing the Air Force to amend its old weather balloon story. Now it wasn't just any weather balloon. It was supposedly a top secret Mogul balloon made up of multiple weather balloons and radar targets and launched from nearby Alamogordo, N.M.
intelligence agents involved in the earlier report issued an additional "Case Closed" report on the stories of bodies being recovered. According to him, the reports of bodies were nothing more than highly distorted memories of "crash dummies" used in ejection tests carried out in New Mexico during the 1950's. FACTOID 1: The Air Force claimed in their 1994/95 Roswell Report that a government photoanalysis lab which they refused to identify ("a national level organization") was unable to "visualize" any "details" in the Ramey memo from first generation prints and negative copies even after digitizing (computer scanning) supposedly because of "insufficient quality." As you look at higher resolution scans readily available to civilians from similar prints, how much "truth" do you suspect was in the Air Force statement? Gen. Hoyt Vandenberg, the acting AAF Chief of Staff at the time. Ramey is providing Vandenberg an update on the very fluid situation in-the-field at Roswell. The first paragraph describes what had been found. Ramey starts by acknowledging "THAT A 'DISK' IS NEXT NEW FIND." He then adds that "THE VICTIMS OF THE WRECK" and something else (possibly just "A WRECK") had also been found near the recovery "OPERATION AT THE 'RANCH'." At the end it states that "YOU" (i.e. Gen. Vandenberg) had ordered the "victims" and/or the wreckage "FORWARDED" to "FORT WORTH, TEX." In the second paragraph, Ramey describes how the situation was being handled. Ramey first states that something "IN THE 'DISC'", probably the bodies of the "forwarded" "victims" (and possibly termed "AVIATORS") would be flown by a B-29 Special Transport or C-47 to the "A1" (personnel director) of some "8TH ARMY****" division, most likely the head flight surgeon at Fort Worth given the context. Wright Field, Ohio, home of the AAF's aeronautical labs, was to assess the Roswell crash object (possibly referred to as an "AIRFOIL"). Finally Ramey outlines how the situation was being treated publicly and how they were going to cover it up. First he assures Vandenberg that the earlier highly inflammatory Roswell base press release (referred to as the "MISSTATE MEANING OF STORY") was the work of an Army counter-intelligence team ("CIC/TEAM"), but that the "NEXT SENT OUT PR" (Press Release) would be "OF WEATHER BALLOONS." Ramey finishes with the statement that the weather balloon story might be better accepted if they also added weather balloon radar target demonstrations. This apparently was the impetus for the national debunking campaign using the devices that followed over the next few days. FACTOID 3: In a remarkable breach of protocol, Air Force counter-intelligence released its summary Roswell Report 9 months before the GAO had concluded its investigation. Newsweek Magazine called it a "preemptive strike." Barely noticeable in one of the 1947 photos and clutched in Gen. Ramey's left hand is a slip of paper (boxed in red). Probably unwittingly, Gen. Ramey had the text side facing towards the camera, allowing the text on this paper to be photographed. When blown up and analyzed, it tells a remarkably different story of events from the one Ramey or contemporary Air Force counter-intelligence wants you to believe. FACTOID 2: Recent attempts by several investigators using the Freedom of Information Act to get a copy of the actual photoanalysis report cited by the Air Force (but never published) has met with responses that they have no idea what became of it. Read the details of the runaround the Air Force gave one investigator as they bounced him from archive to archive for t5 years. Why can't the Air Force find their own Roswell report? Why do they still refuse to disclose the identify of the photoanalysis lab?